Are you confused — even intimidated — by Google Analytics? Good news: you’re not alone. GA is notoriously complicated. In fact, when I first started to delve into GA’s waters, I wondered if I’d ever truly get it. There were so many concepts to learn and reports to run. How did people ever conquer this thing?!?! Lots and lots of reading and trial and error, it turns out. I’m not saying I’ve reached total mastery — there’s always something new to pick up — but I’m vastly more comfortable. And I want you to be, too. So here’s the cheat sheet to everything I’ve learned over the years. This guide might be long, but it’ll take you from zero to hero in 6,000 words. And if you still have questions, let me know! I’m @ajavuu on Twitter. Time for a lightning round of questions. GA is an analytics tool that gives you an extremely in-depth look at your website and/or app performance. It integrates with all of Google’s marketing products (including Google Ads, Search Console, and Data Studio) making it a popular choice for anyone using multiple Google tools. There is a free and paid version of GA (the latter is called Analytics 360). Small and medium-sized businesses will likely get all the features you need from the free version. Enterprise businesses need to upgrade — at least if you want advanced funnel reporting and attribution modeling; roll-up reporting; more views, dimensions, and metrics per property; and unlimited and unsampled data. Paying for 360 also gives you access to dedicated support, including your own account manager. This alone can make the subscription fee worth it. And about that subscription fee? It’s not cheap. Analytics 360 begins at $150,000 per year (invoiced monthly) and increases after your site receives more than one billion monthly hits. 360’s cost will price out many businesses. However, if you have the budget for both the service and an agency or in-house analyst to manage your analytics operations, consider investing. With that out of the way, let’s get to the good stuff. Create an account, if you haven’t already. Add the name, URL, and industry of the website you want to track. Do you need to add the GA code to every page of your site? That’s a lot of manual work — especially if your website has more than 50 pages. Plus, what happens when you create new pages? Do you need to add the tag every time?!? Relax, because the short answer is: no. The longer answer: you only need to add the tag to every page template. So, if you have one page type on your site (meaning every individual page uses the same header module), you only need to add it to that module — and it’ll be applied to every page. If you have two page types, you’d need to paste the code into the two separate header modules. Three page types? Three header modules. And if you use a CMS like HubSpot or WordPress, this task is even easier. These tools come with a separate field where you paste your tracking code just once. HubSpot users can follow these simple instructions for adding GA.
For more, read our guide to installing the Google Analytics tracking code on your site. To set up GA properly, you must understand the various layers. The organization is the highest level. It represents a company. For example, our organization is HubSpot, Inc. One organization can encompass multiple GA accounts. Organizations are recommended for larger businesses, but not mandatory. Accounts are not optional. Using Google Analytics requires at least one (sometimes several) accounts. An account doesn’t mean a user account. I can log into the HubSpot Google Analytics accounts using my Google email ID. HubSpot’s head of technical SEO can also log into the same account using his Google email ID. Our historical optimization specialist can also log into the same account using his Google email ID. You can assign one property to each account or multiple properties to one account. Every account can hold up to 50 properties. 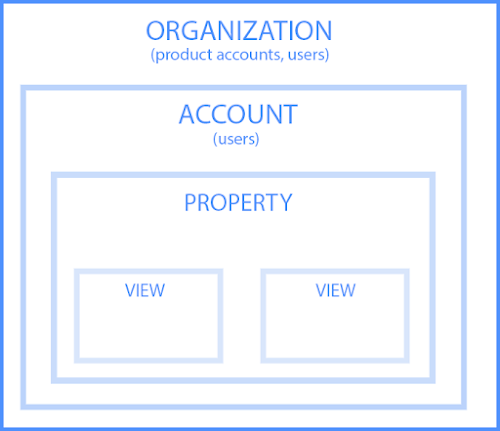 You can give user permissions for an entire Analytics account, a property in an account, or a view in a property. It depends on your use case and goals. For example, suppose you have one website — the Stark Industries corporate site — and five subdirectories, including the Stark Industries blog, careers section, media resources, case studies, and investor relations information. You want to create separate properties for each subdirectory so the people on each team can look at how their portion of the site is performing, as well as the larger site. But maybe you have another site that discusses Tony Stark’s work with S.H.I.E.L.D. You want the S.H.I.E.L.D. team to see data for this subdirectory, but you don’t want them to see data for the rest of the website. You create a new account and property for the S.H.I.E.L.D. site. A property is a website or app. Each property can support up to 25 views. A view only captures the information after your filters and configured settings have been applied. And once you delete a view, that data is gone forever. For those reasons, it’s critical to keep an unfiltered view of your data. Dimensions = categorical variables. Simple examples include names, colors, and places. Metrics = quantitative variables. Basic examples include age, temperature, and population. Or as my Data Analytics professor put it, “Metrics are what you can do math on.” Not the most eloquent phrasing, but it works. In any GA report, your dimensions are your rows and your metrics are your columns. 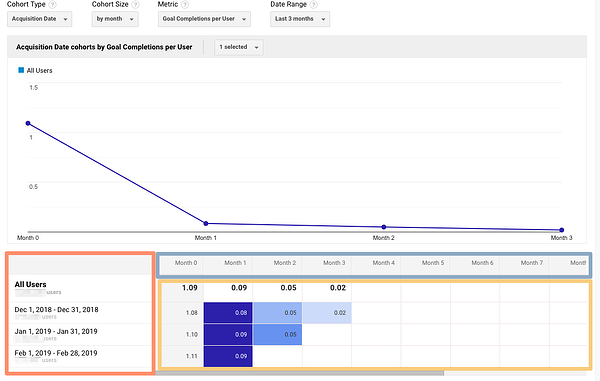 GA lets you create custom dimensions and metrics from Analytics data plus non-Analytics data. To give you an idea, suppose you track the membership type of customers who have created an account in your CRM. You could combine this information with pageviews to see pageviews by member type. Using these dimensions will give you invaluable information. Follow GA’s instructions to set up custom dimensions and metrics. What’s a Google Analytics audience? GA comes with several built-in audiences (including the two I just mentioned, location and age). You don’t need to do a thing to set these up — once you have the tracking code installed, GA will automatically break down your visitor data into these audience reports. However, you can also create custom audiences. Perhaps you’re only interested in Australian millennials; you’d need to make a custom audience that only includes visitors who are A) in Australia and B) between the ages of 25 and 34. Creating an audience is fairly easy. Honestly, the hardest part is figuring out what you’re trying to accomplish and then identifying the user characteristics that’ll help you do that. Once you’ve done that, follow these instructions to create a new audience segment. From there you can import a segment to use as the basis for your Audience Report. What’s a Google Analytics segment? A segment is a subset of your data. I like to picture an entire pizza made up of all different slices — one slice has pesto and mozzarella, another has sausages and spicy peppers, another has ham and pineapple, and so on. Metaphorically speaking, each slice is a segment. Like audiences, GA provides you with several segments. I wouldn’t stop there: you can get incredibly granular with your segments. The sky is your limit — well, that, and GA’s segment cap. You can apply up to four segments at a time to any report. GA’s left-hand sidebar can be a bit overwhelming. You’ve got six reporting options (all with confusing, vague names), and clicking on any of those only gives you more options. Let’s walk through each report together. As the name suggests, the Real-Time report gives you insight into what’s happening on your site at this very moment. You can see how many visitors are on your site, which pages they’re visiting, which social platforms they’re coming from, where they’re located, and more. These are useful, but as you’ll see, the other reports pack a far greater punch. This report gives you a high-level overview for the property you’re currently looking at. Check this report once a day to get a sense of how you’re trending overall. 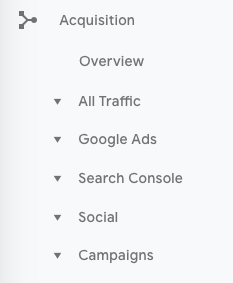 Underneath “Overview,” you’ll see “Audiences,” as well as expandable menus for “Demographics,” “Interests,” “Geo,” “Behavior,” “Technology,” “Mobile,” “Cross-Device,” “Custom,” and “Benchmarking.” Explore each of these sections to get a sense of what they can tell you about your visitors. Every section describes an audience. Whoever named this report belongs in the same group as the person who named guinea pigs: “active users” doesn’t refer to users currently on your site — that’s the Real-Time report — and guinea pigs are neither pigs nor from Guinea. What’s the value of this report, you ask? If you have more 1-day users than longer-term ones, you’re struggling with retention. People aren’t coming back to your site or app — you need to figure out why. I’d also recommend looking at this report with various segments; for instance, perhaps you see that users in a certain age bracket have much better retention than the average. First things first: do you need a refresher on Customer Lifetime Value (CLV) and how to calculate it? We’ve got you. The Lifetime Value report gives you a sense of how valuable users are to your company. You can see lifetime value for, say, the users you generated from email marketing versus the ones you acquired from organic search. Armed with this information, you can decide which channel to invest more in. A few notes: Lifetime Value is capped at 90 days. The Acquisition date range, however — which you can adjust — is available from March 2017 onward. This range reflects all the users you acquired in that time frame. Imagine you’re interested in looking at transactions per user for users you acquired in the week before Black Friday. You’d adjust the date range to that week specifically. Then you’d see the average transactions per user for that cohort over the following 90 days. Because HubSpot is a SaaS company, not an ecommerce business, I look at goal completions per user, pageviews per user, and sessions per user by Acquisition Channel. If my team has recently wrapped up a marketing campaign, I’ll look at the same metrics by Acquisition Campaign. But if you are in ecommerce and want to see transaction and revenue data, you’ll need to have ecommerce tracking set up. I recommend this excellent blog post on tracking CLV with custom dimensions and metrics as well. You should also give this explanation of why you shouldn’t track CLV in GA a read. So, how does it work? 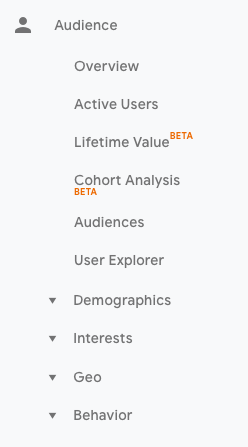 This report groups users by one characteristic — so far, “Acquisition Date” is the only “Cohort Type” you can use. By the way, Acquisition Date is the day a user first visited your website. You have several options from there. First, pick your cohort size: day, week, or month. Next, pick your metric, or what you want to explore for this cohort. It can be further broken down into Per user, Retention, and Total. Per user means the total count of that metric divided by the cohort size. So if you choose Transactions per user, for example, you’ll see the average number of transactions per user for that cohort. Retention is simple: user retention, or the number of users who returned that day, week or month (determined by the cohort size you selected) divided by the total number of users in that cohort. Total: the total number of sessions, transactions, etc. that occurred for that cohort size. Choose your date range. GA lets you see up to three months of data. Now let’s dive into reading the report, because it’s not obvious. The left-hand column shows you the Cohort Type you picked — Acquisition date, by default — broken down by Cohort Size (day, week, or month). The row outlined in light blue reflects the Cohort Size you’ve chosen. Remember that data only goes back three months at the max. The row outlined in yellow shows you the values for the metric you chose (in this case, Goal Completions per User). In the eternal words of Calvin Harris: baby, this what you came for. Look at the first row. This tells you the average goal completions for the entire cohort in the first month after they were acquired was 1.09. Average goal completions for the entire cohort in the second month after they acquired dropped to 0.09. By the last month, it’s 0.02. Now look at the next three rows. It looks like average goal completions per user in the first month after they were acquired increased slightly from December to January and again from January to February. This is pretty usual behavior. Let’s imagine that instead, this report tells us average goal completions per user for February 1-28, 2019 (the last row) was 4.07. Woah! That’s nearly four times as high as December and January. We’d definitely want to investigate further. And to do so, all we have to do is right-click on the cohort we’re interested in. Make sure you click on the column if you want the entire day, week, or month analyzed. 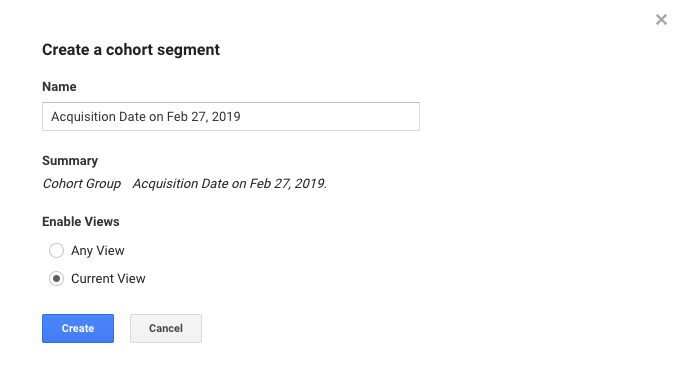 Click on a cell if you want to analyze only the users who, for example, completed a goal three days after they were acquired on February 27, 2019. Voila — now you can compare this cohort to any other segment in any report you choose. From All Traffic, you can click into Channels. Click on any category to explore each source in detail. To see this information presented visually, click on All Traffic > Treemaps. 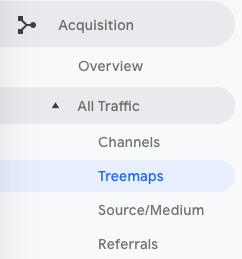 This post walks you through how to read and adjust the Treemaps report. The next report, Source/Medium, breaks down the general category of traffic (which you saw in “Channels”) into the search engine or domain. It’s useful if you want to get more granular insight into the ways people are coming to your site. For example, you might notice that a whopping 70% of your referral traffic is coming from LinkedIn, while just 5% is coming from Pinterest. Depending on your marketing team’s priorities it may be time to shift focus. The last report, Referrals, reveals the specific URLs that sent people to your site, e.g. your referral traffic. I like to add “Landing page” as a secondary dimension so you can see which pages on your site are receiving the referral traffic. Out of all the reports in GA, I use the Behavior ones the most. This report gives you a review all of the blog posts, landing pages, web pages on your site. Let’s start with Site Content > All Pages. This shows the top-trafficked pages for your current view and/or segment. It’s useful in and of itself — you should always keep a careful eye on your most viewed URLs — but I especially like it when I’m analyzing traffic growth or declines. To give you an idea, maybe total traffic to my website has dropped 10% month over month. I’d navigate to Site Content > All Pages and change the date range to this month compared to the last month (making sure the days of the week match up). This helps me identify which pages received less traffic and contributed to that decline. Helpful tip: I like to change the “Sort Type” from “Default” to “Absolute Change” so I see the results sorted by the greatest differences in percentage rather than total views. I also add Page Title as a secondary dimension so I can see the name of each page alongside its URL. You get the drift. This report is probably most valuable for those managing highly complex properties. Landing pages is another one of my favorite reports. GA defines a landing page as the first page in a session — in other words, the visitor’s first interaction with your website. There are a few ways to slice and dice this report. First, if you’re interested in the sources (organic, paid social, direct, etc.) driving users to the landing page, you can add Source/Medium as a secondary dimension. This is basically the opposite version of the report we added earlier. Maybe you’re most interested in the landing pages that mobile and tablet users see — so you choose the Mobile and Tablet Traffic. Or perhaps you’re curious about users who ended up buying something, so you choose the “Made a Purchase” segment. There are lots of possibilities here. 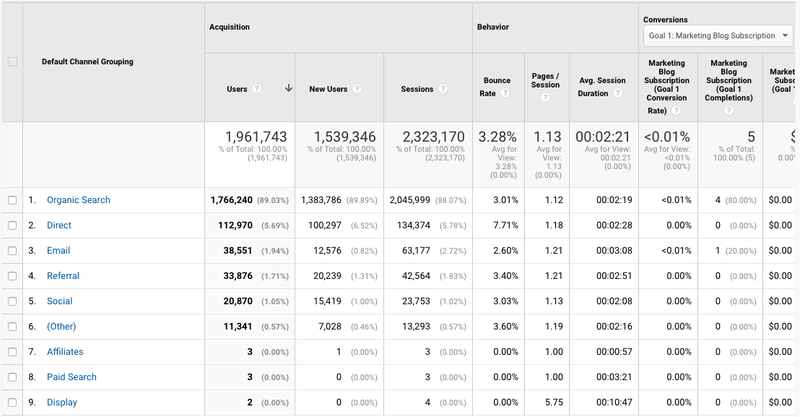 This report shows the last pages users visited in their sessions before they left your site. That’s a little confusing, so let’s use an example. I want to find a place to grab dinner with my friends, so I search “Mediterrean restaurants near me.” A place that looks good pops up, so I click on it. First, I check out the menu. They have a hummus sampler — yum. Then I click on their press page. It links to a recent article on Eater, so I leave the site to read it. The reviewer loved the food. I’m sold. The Press page would be my exit page. You may hear that you should analyze your exit pages to understand why users are leaving your site — I think this example reveals why that strategy doesn’t always make sense. Just because someone has left doesn’t mean anything is wrong with the content. So, check this report out, but take the data with a grain of salt. This report is pretty self-explanatory: it tells you how quickly your site is loading for users. 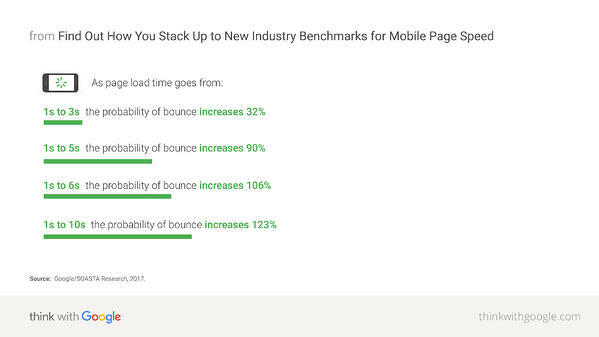 Obviously, the faster the better — not only do faster pages correlate with higher revenue, but Google’s algorithm takes page load time into account. This report delves into the average page load times for each URL. I use it to identify the slowest-loading pages on HubSpot’s site with the ultimate goal of figuring out why they’re taking their sweet, sweet time and how to speed them up. First things first: if users can search your website, make sure you’ve set up Site Search in GA. You must enable it for every view separately (here are the step-by-step instructions). I typically start with the “Usage” report, which tells me how many sessions occurred with and without one-plus searches. In other words, I learn how frequently people used site search for the view and time period I specified. Here’s where you learn what people are searching for. Look for themes: if you see the same search terms coming up multiple times, there are a few conclusions you could draw. Either you need to create new content that gives users the information they’re looking for, and/or you need to better surface existing content so it’s easier to find. 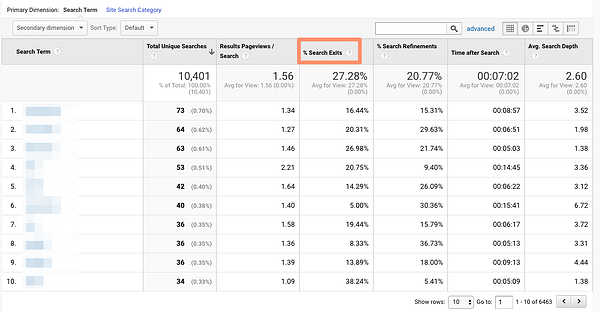 This report displays which pages users are starting searches from. It’s important to think about this contextually. Maybe people are commonly beginning searches from your 404 page — that makes sense and isn’t anything to be alarmed about. If, on the other hand, they’re starting searches from a product landing page, something’s wrong. The content clearly isn’t living up to the expectations they had when they clicked the ad link. 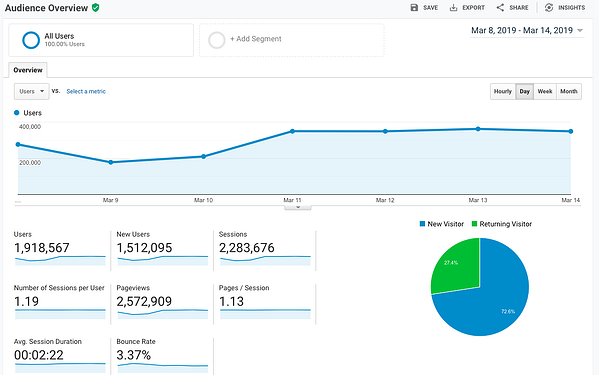 Loves Data provides a solid overview of GA’s Site Search reports if you want to explore them even further. A user clicks a button. Then they download a file. Next they watch a video. No, this isn’t the world’s most boring bedtime story — it’s an example of a GA event. Three events, to be specific. Those user interactions are up to you; you’ll need to add special code to your site or app that tracks the specific actions you’re interested in. Here are the instructions. If you’re not excited about events tracking already, I want you to get excited. There are infinite possibilities here: if you have an event set up for watching a product demo, and another for clicking a link to an external review of your tool, you can measure how many times each event happened. Maybe you discover your video isn’t getting many plays. It’s probably time to optimize the current video, make it easier to find on your site, or create a new one. Or perhaps you see that way more users than you expected are checking out the third-party review of your product. That tells you users want more social proof and testimonials. Since the review is favorable, you might want to put it front and center on your site. This report tracks the events taking place most frequently — pretty straightforward. You’ll see total events (e.g. how many times that event happened) and unique events (how many sessions included one or more occurrences of that event). 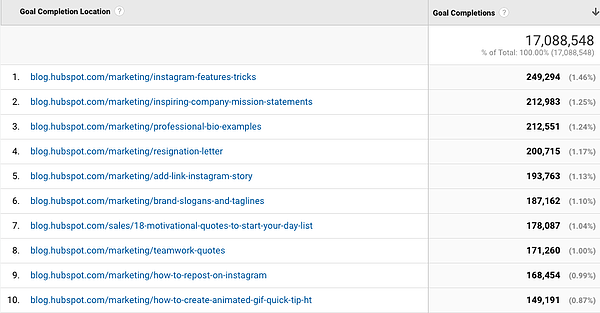 In this report, you can see which pages generate the most actions. I typically add “Event Category” as the secondary dimension, then filter for the event I’m most interested in. Now I can see which posts generate the most CTA clicks. Hopefully you’re starting to see the power of event tracking! To give you an idea, maybe users frequently watch your demo video, then click the CTA to schedule a call with a salesperson. Imagine you see that videos are played far more often than PDFs are downloaded. For example, perhaps people coming in via organic scroll to the bottom of your pricing page far more than people coming in via social media. Note: this report is very subject to sampling. (Read more about GA’s data sampling practices here.) Sampled data is usually pretty accurate, but it means the more important the conclusion you’re drawing, the less uncertainty you’ll be able to tolerate. To reduce the level of sampling, make the date range smaller. If you monetize your website with Google AdSense or Ad Exchange, you can use the Ad Manager and Google Analytics integration to bring information on how your ad units are performing into GA. If you have a website, you have an objective — probably several — for the people who visit your site. Ecommerce store owners want their visitors to subscribe to their mailing list, make a user account, add something to their cart, and/or complete the order confirmation process. B2B businesses want their visitors to download an ebook, sign up for a webinar, or book a call with a sales rep.
Google Analytics makes it possible to measure all of these things — plus many more. Once you’ve identified your goals, take a look at these instructions for creating, editing, and sharing them. This guide on choosing goal values is also quite helpful. Head here to learn how you’re doing goal-wise across the board. I get the most from this report when I compare date ranges and/or look at goal completions by segment. For example, quickly looking at goal completions by device reveals mobile visitors sign up for the blog newsletter much less frequently than desktop and tablet visitors. That could be because it’s hard to sign up for the newsletter on a phone — or it could be mobile users are looking for one thing and ending their session as soon as they’ve found it. I should dig in more to decide which case it is. Knowing a goal was completed isn’t helpful in and of itself; you also need to know where it happened. Suppose you’ve embedded the same form in three separate pages on your site. It’s great that Daenerys Stark from Dragonstone, Blackwater Bay just filled out your form to get in touch with a consultant, but which page did she fill it out on? Reverse Goal Path is the unsung hero of the Conversion section. Well, I’m singing its praises now. This report allows you to see the last three pages a user visited before completing the goal. It’s useful for goals that aren’t sequential. Maybe you have a contact form that appears in multiple places on your site, or there are two different paths that lead users into buying your ebook. Thanks to this report, you can understand the various ways people arrive at the end destination — and there’s no need to set up a funnel. I usually filter down to a specific goal completion location or goal previous step 1, 2, or 3. 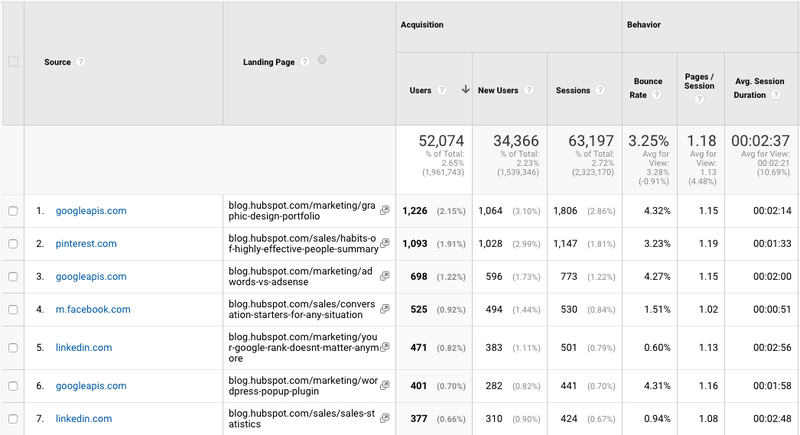 For example, since I’m interested in seeing which blog posts generated leads from content downloads, I added “Goal Previous Step – 1 containing blog.hubspot.com” to the filter. “(Entrance)” means the user came to the site on that step; “(not set)” means the user didn’t complete any steps prior to that one — because they weren’t on the website yet. For a comprehensive exploration of Reverse Goal Path, take a look at OnlineMetrics’s guide. 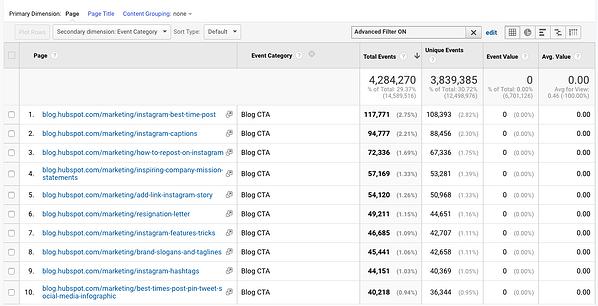 For sequential goals, Funnel Visualization is your go-to report. At each stage, you can see user drop-off. That lets you identify areas where you can improve conversion rates; for example, maybe you lose a lot of users during the checkout process. You change the flow so they can check out as a guest (versus needing to create an account), which dramatically reduces checkout abandonment. To see this level of detail, you’ll need to map out your goals as a series. If all of your goals are simply the end objective, like “Arrived at the order confirmation page,” you won’t be able to reverse-engineer how users progress. 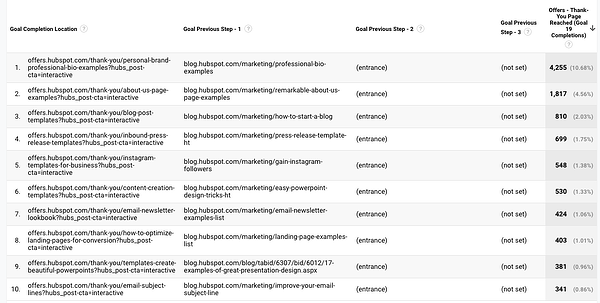 The Funnel Visualization report also requires you to mark the first step in the goal path as required or not. If you tell GA that yes, the first goal needs to be completed, Funnel Visualization will only show you the sessions where the user first finished goal #1. If a user skips goal #1 and goes straight to goal #2, their session won’t be represented here. Read WPromote’s primer on Funnel Visualization next to get more details on setting up and reading this report. If Funnel Visualization is the uptight relative who always made you take your elbows off the table and wash your hands before you ate, Goal Flow is the laid-back, fun relative who’d randomly take you out of school to go to the zoo. All that to say: Goal Flow gives you a lot more freedom than Funnel Visualization. Unlike the latter, Goal Flow shows you all sessions that led to the completed end goal — regardless of whether the user completed the required goal #1 or not. 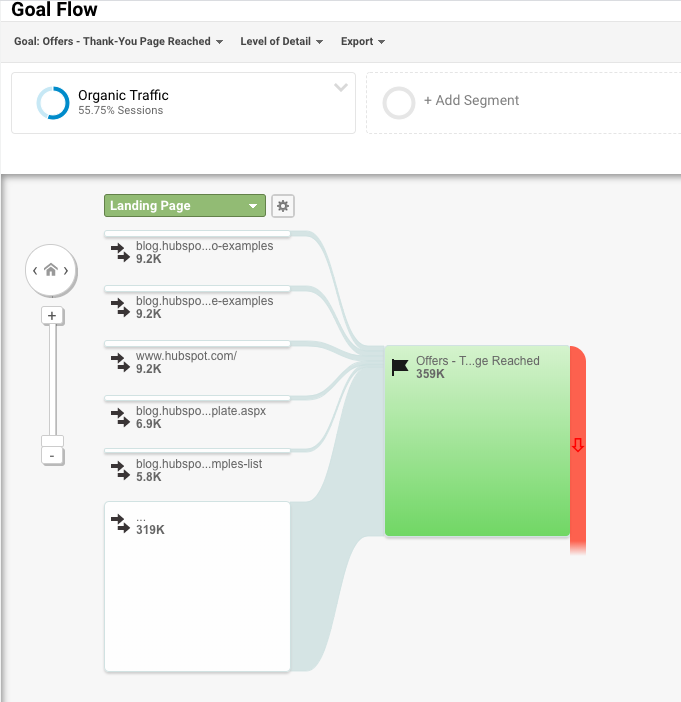 Another difference from Funnel Visualization: Goal Flow also shows you loopbacks — i.e. when a user goes back to a previous page or refreshes their current one. If the user skips a step, Funnel Visualization “backfills” it. Goal Flow doesn’t. If you edit an existing funnel or create a new one, Funnel Visualization will show you all your data from that moment onward. Goal Flow, on the other hand, can show you data from the past. 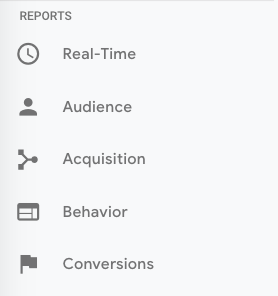 You can also toggle the Dimension and Level of detail of the report, as well as the segment, to get even more granular. I recommend looking at various segments to see which convert at the highest and lowest rates — plus where they commonly drop out. This report is helpful if you’re A) using Google Ads and B) not measuring conversions. Basically, Google uses machine learning to identify your “best” sessions — or those likeliest to generate conversions — and then translates those themes into Smart Goals. Once you have Smart Goals, you can use them in Google Ads to optimize your ads performance. Smart Goals are controversial within the marketing community because the data is minimal and businesses will be far better served by setting up their own conversion tracking. Keep that in mind if you decide to use them. Google Analytics is a highly valuable tool for any business as it gives you tangible data that you can apply to grow your business. Bookmark this guide and come back to it as your data tracking becomes more sophisticated. Good luck on your Google Analytics journey.